The winners of the 2013 George Polk Awards were announced Sunday and DC journalists were well represented among them. Out of 30 journalists honored, 8 were from DC. WaPo did particularly well, with their journalists taking home awards in 3 of the 13 categories. 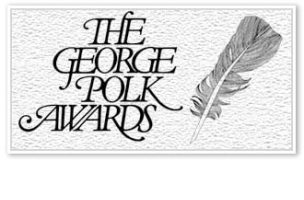 The George Polk Awards in Journalism are conferred annually to honor special achievement in journalism. The awards, which place a premium on investigative and enterprise reporting that gains attention and achieves results, were established in 1949 by Long Island University to commemorate George Polk, a CBS correspondent murdered in 1948 while covering the Greek civil war. Best National Security Reporting: WaPo‘ s Barton Gellman for “U.S., British intelligence mining data from nine U.S. Internet companies in broad secret program” about the Edward Snowden leaks. This award was shared with Ewen MacAskill and Laura Poitras of The Guardian. Best National Reporting: WaPo‘s Eli Saslow for ‘Waiting for the 8th” about the lives of the people who receive assistance from the federal food stamp program. Best Political Reporting: WaPo‘s Rosalind S. Helderman, Laura Vozzella and Carol Leonnig for “McDonnell apologizes, repays loans” about the scandal that led to the indictments of Gov. McDonnell (R-VA) and his wife. Best Business Reporting: Center for Public Integrity’s Alison Fitzgerald, Daniel Wagner, Lauren Kyger, and John Dunbar for “After the Meltdown” demonstrating that regulators and prosecutors have failed to hold a single major player on Wall Street accountable for the reckless behavior that sparked the 2008 financial crisis. Great job, y’all! And keep up the good work!